In 1983, UNESCO endorsed April 18 as the International Day for Monuments and Sites, on the proposal of the International Council on Monuments and Sites (ICOMOS). According to ICOMOS, "This special day offers an opportunity to raise public awareness concerning the diversity of the world’s heritage and the efforts that are required to protect and conserve it, as well as to draw attention to its vulnerability." Every year, ICOMOS assigns a theme to the celebration. In 2012, we mark the 40th anniversary of the Convention concerning the Protection of the World Cultural and Natural Heritage or the UNESCO World Heritage Convention. And this year's theme is: World Heritage. 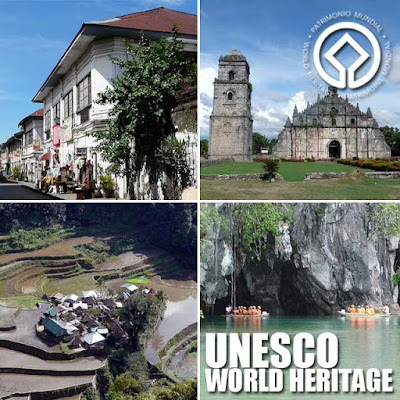 The Philippines has five UNESCO World Heritage inscriptions in 11 cities and municipalities around the country. These are the Tubbataha Reef in Cagayancillo, Palawan, Puerto Princesa Subterranean River National Park in Palawan, Rice Terraces of the Philippine Cordilleras (Batad and Bangaan in Banaue, Nagacadan in Kiangan, Hungduan and Mayoyao all in Ifugao), Historic Center of Vigan in Ilocos Sur, and the Baroque Churches of the Philippines (Paoay Church in Ilocos Norte, Sta. Maria Church in Ilocos Sur, San Agustin Church in Intramuros, Manila, and Miag-ao Church in Iloilo). To give you a quick background on how sites get nominated to the UNESCO World Heritage List, read Nominating properties to the UNESCO World Heritage List. To know more about the UNESCO World Heritage Sites in the Philippines, watch this AVP narrated by Archt. Augusto Villalon. To learn more about the International Day for Monuments and Sites and this year's theme, read the article presenting this year's theme by Alfredo Conti, Chair ICOMOS World Heritage Working Group.